Bonjour is known for being on the pricy side of things, but that's just fine with them. You get what you pay for, and at Bonjour it's the highest quality imported ingredients and food that is meant to taste perfectly French. Francophone Thai Chef Buum heads the kitchen, with signature dishes like 400 days Wagyu Beef Chateaubriand, Royal Blue Lobster Bisque and Specialities of Foie Gras. Owners Xavier Pierre Olaf Roger Bruzaud-Grille and his sister Ingrid run a tight ship ensuring that all details are to perfection. There's also a new Bonjour Terrace for outdoor lounging, and swans on the property's lake. 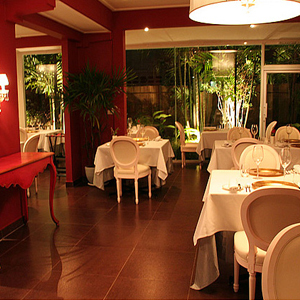 On Sukhumvit, turn into the small soi between soi 59 and 61, Bonjour is behind the Fullerton Condominium. No recent insights for this venue. No up-coming events for this venue. W5 | Articles | Venues | Editorial | Privacy | Contact | W5 Google+ © 2019 W5 Co., Ltd.